There’s a special type of connection between a kiter and their harness of choice. If you kite a lot and spend more hours with your harness than you do with your girlfriend you will soon realise money should be no obstacle in finding one that is going to become your best friend. You want a harness that is supportive, doesn’t bite (chafe) when the going gets tough, is going to last the distance and most importantly fits you like a glove … so you and your harness can become one. Yes, this relationship is unique – so take your time, try lots out and find your soul harness … it’s out there somewhere! This issue we review two sweet harnesses for 2016. Check ‘em out. The first thing you will notice when trying on one of these babies is the “aaaaahhh” factor. You will notice immediately just how damn comfy these harnesses are. And that’s no surprise. ION set out to build their harnesses for pure comfort using high quality foams and technologies for their entire range. Using this harness was a pleasure. Easy to put on, easy to adjust and it suits a range of styles. I like to surf sometimes and wake style others and this is one harness that adapts nicely to both. Tighten it up for free/wake style and it provides lots of support and protection from crashes. Loosen it off for surf style and it won’t chafe you as you rotate from toe to heelside when smashing up the waves. One thing I did notice when using it for surf style is you really need to wear a rashie so that it slips and rotates a little easier on you as the foam, whilst super comfy and doesn’t rash you up, does grip on to your bare skin making it a little awkward at times to twist. Also, this harness has extended side flaps that wrap around your hips to your ribs a little more. This makes the harness very comfy but I did notice the extended flaps have a tendency to fold in when spinning the harness in surf style. This is a very minor problem though as a slight wriggle and you will sit the harness comfortably once again. I also think this is dependent on your body shape … let’s just say I could lose a few extra kilos and this wouldn’t occur! All in all though a fantastic, super comfy harness that is easily adapted to suit your style. To sum up this harness: it’s like the Lazy Boy lounge chair of harnesses … just slip in and relax! If you haven’t tried a ION harness out go out there and do it NOW. Definitely a contender. New kid on the block Ride Engine has hit the market with an explosion with their radical new designs in the harness market. Designed with support as main priority these harnesses are unlike any other harness you have ever tried. The first thing you will notice when strapping one of these bad boys around you is it’s like stepping into a suit of armour, sort of Iron Man-esque … they feel good and they feel strong. The back of the harness is a complete shell of carbon fibre with lots of cushy foam to mould to your back shape. The idea of the stiff back mould is to keep your spine nice and safe and distribute the load of the harness more evenly around the entire harness which it seems to do nicely. The harness itself is lighter and has a smaller footprint than most which gives a free feeling when riding, not bogged down in lots of gear. Sliding spreader bar – hooked in freestyle/surf style (no good for fast unhooking or learning). Fixed spreader bar – unhooked freestyle, learning. Carbon plate – hooked in surf style. Patrick Rebstock uses this system for a good reason. 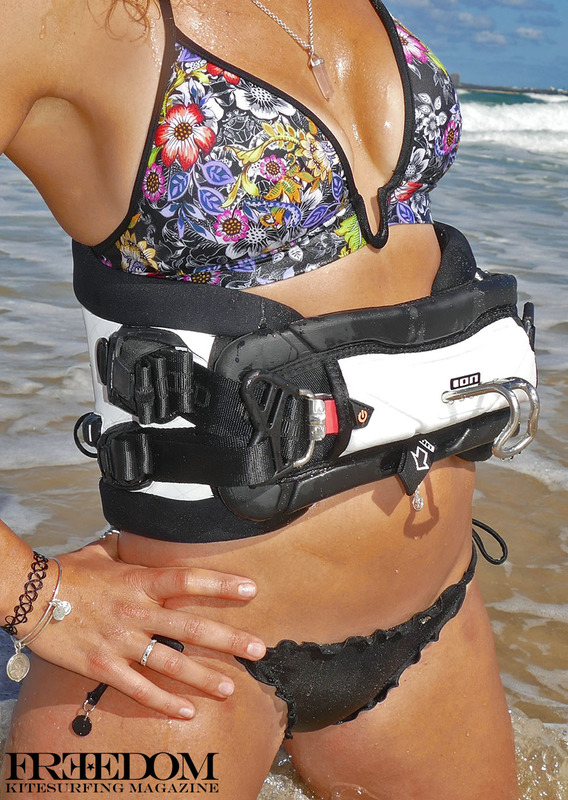 Mega support without having to twist your harness from side to side and awesome for allowing the body to easily twist to adapt to the waves. If you have a bit of a gut having to have this harness tight (how it is designed to be worn) isn’t the most visually appealing sight without a rashie on … haha. But, if you’re fit then this harness looks damn good! The Ride Engine Carbon Katana Elite is a serious piece of harness bling – they look great and feel tough. Suitable for the more advanced rider going big looking for safety in back support and super high quality. Big thank you to our gorgeous model Samaya Packman.